Was Jesus - 'Isaa (a.s.) Raised "Dead" or "Alive" ? Recently I have received serious queries concerning 'Isaa (a.s.)'s final days. Here are the verses of the Qur'an on this important subject. Was salaamun 'alayhi yawma wulida wa yawma yamuutu wa yawma yub-'asu hayyaa! "So Peace is on me the day I was born the day that I die and the Day that I shall be raised up to life (again)"! "Hence, peace was upon me on the day when I was born, and [will be upon me] on the day of my death, and on the day when I shall be raised to life;! [again]"
Was salaamun 'alayya yawma wulittu wa yawma yamuutu wa yawma yub-'asu hayyaa! 1. The verse number 15 was Revealed in connection with Prophet Yahya (a.s.) who is also known as John. 2. The verse number 33 was Revealed in connection with Prophet 'Isaa (a.s.) who is also known as Jesus. (a) The Days of the BIRTHS of these two Prophets. (b) The Days of the DEATHS of these two Prophets. (c) The Days of the RAISING TO LIFE AGAIN of these two Prophets. If one was to believe that Prophet 'Isaa (a.s.) i.e. Jesus Christ has been RAISED UP ALIVE with his Physical BODY and he has yet to DIE the Physical DEATH at some future date, then that person has changed the ORDER OF THE REVEALED SEQUENCES OF EVENTS in verse 33 as well as the person has changed the intended meaning of this Revelation. The following Verse 10: 15 clearly tells us that even the Prophet (s.a.s.) could not CHANGE THE TEXT that was once Revealed by Allah (swt). But when Our Clear Signs are rehearsed unto them those who rest not their hope on their meeting with Us say: "Bring us a Reading other than this or change this." Say: "It is not for me of my own accord to change it: I follow naught but what is revealed unto me: if I were to disobey my Lord I should myself fear the Penalty of a Great Day (to come)." There is difference of opinion as to the exact interpretation of this verse. The words are: The Jews did not kill Jesus, but God raised him up (rafa'u) to Himself. One school holds that Jesus did not die the usual human death, but still lives in the body in heaven; another holds that he did die (v. 120) but not when he was supposed to have to be crucified, and that his being "raised up" unto God means that instead of being disgraced as a malefactor, as the Jews intended, he was on the contrary honoured by God as His Apostle; see also next verse. The same word rafa'a is used in association with honour in connection with Mustafa in xciv. 4. Wa rafa' naa laka dhikrak? Cf. 3:55, where God says to Jesus, "Verily, I shall cause thee to die, and shall exalt thee to Me." The verb rafa'ahu (lit., "he raised him" or "elevated him") has always, whenever the act of raf' ("elevating") of human being is attributed to God, the meaning of "honouring" or "exalting". Nowhere in the Qur’an is there any warrant for the popular belief that God has "taken up" Jesus bodily, in his lifetime, into heaven. The expression "God exalted him unto Himself" in the above verse denotes the elevation of Jesus to the realm of God's special grace - a blessing in which all prophets partake, as it is evident from 19:57, where the verbrafa'nahu ("We exalted him") is used with regard to the Prophet Idris, (See also Muhammad Abduh in Manar III, 316 f., and VI, 20f.) The "nay" (bal) at the beginning of the sentence is meant to stress the contrast between belief of the Jesus that they had put Jesus to a shameful death on the cross and the fact of God's having "exalted him unto Himself." In these verses the word Rafa'naa is used in connection with the Mountain of Sinai (Tur-u-Sinin or Jabal Musa) in Arabia. This is understood to refer to the second coming of Jesus in the Last Days before the Resurrection, when he will destroy the false doctrines that pass under his name, and prepare the way for the universal acceptance of Islam, the Gospel of Unity and Peace, the Straight Way of the Qur'an. Please Note: The name of JESUS is mentioned by the translator within the brackets ( ). The name of Jesus does not appear in the original Arabic Text. The term DAJJAL is also not to be found in the Glorious Qur'an nor the supposed Battle between him and Jesus. Translator Abdullah Yusuf Ali was a Musta'aliyan Shiah. AND, BEHOLD, this [divine writ] is indeed a means to know [that] the Last Hour [is bound to come]; (41) hence, have no doubt whatever about it, but follow Me: this [alone] is a straight way. Whereas most of the commentators regard the pronoun hu in innahu as relating to Jesus and, consequently, interpret the above phrase as "he is indeed a means to know [i.e., an indication of the coming of] the Last Hour", some authorities - e.g., Qatadah, Al-Hasan Al-Basri and Said ibn Jubayr (all of them quoted by Tabari, Badhawi and Ibn Kathir) - relate the pronoun to the Quran, and understand the phrase in the sense adopted in my rendering. The specific mention of the Last Hour in the above context is meant to stress man's ultimate responsibility before the Creator and, therefore, the fact that worship is due to Him alone: and so this parenthetic passage follows logically upon the mention of the false deification of Jesus. Note: A careful study of the above quoted verses as well as the next verse indicates that Jesus Christ was not raised ALIVE with his Physical Body. Allah (SWT) Exalted Jesus Christ and thus cleared him of the falsehoods. 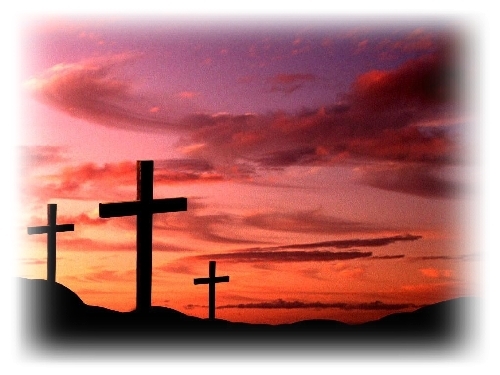 Was Jesus Nailed to the Cross, but he did not Die on the Cross? The end of the life of Jesus on earth is as much involved in mystery as his birth, and indeed the greater part of his private life, except the three main years of his ministry. It is not profitable to discuss the many doubts and conjectures among the early Christian sects and among Muslim theologians. The Orthodox Christian Churches make it a cardinal point of their doctrine that his life was taken on the Cross, that he died and was buried, that on the third day he rose in the body with his wounds intact, and walked about and conversed, and ate with his disciples, and was afterwards taken up bodily to heaven. This is necessary for the theological doctrine of blood sacrifice and vicarious atonement for sins, which is rejected by Islam. But some of the early Christian sects did not believe that Christ was killed on the Cross. The Basilidans believed that some one else was substituted for him. The Docetae held that Christ never had a real physical or natural body, but only an apparent or phantom body, and that his Crucifixion was only apparent, not real. The Marcionite Gospel (about A.D. 138) denied that Jesus was born, and merely said that he appeared in human form. The Gospel of St. Barnabas supported the theory of substitution on the Cross. The Quranic teaching is that Christ was not crucified nor killed by the Jews, notwithstanding certain apparent circumstances which produced that illusion in the minds of some of his enemies: that disputations, doubts, and conjectures on such matters are vain; and that he was taken up to Allah (see next verse and note). NOTE: Earlier we have examined the verse 4: 158 and its note. and in their boast, "Behold, we have slain the Christ Jesus, son of Mary, [who claimed to be] an apostle of God!" However, they did not slay him, and neither did they crucify him, but it only seemed to them [as if it had been] so; 171 and, verily, those who hold conflicting views thereon are indeed confused, having no [real] knowledge thereof, and following mere conjecture. For of a certainty, they did not slay him. Thus, the Qur'an categorically denies the story of the crucifixion of Jesus. There exist, among Muslims, many fanciful legends telling us that at the last moment God substituted for Jesus a person closely resembling him [according to some accounts that person was Judas], who was subsequently crucified in his place. However, none of these Legends finds the slightest support in the Qur'an or in authentic Traditions, and the stories produced in this connections by the classical commentators must be summarily rejected. They represent no more than confused attempts at "harmonizing" the Quranic statement that Jesus was not crucified with the graphic description, in the Gospels, of his crucifixion. The story of crucifixion as such has been succinctly explained in the Quranic phrase wa-lakin shubbiha lahum, which I render as "but it only appeared to them as if it had been so" - implying that in the course of time, long after the time of Jesus, a legend had somehow grown up [possibly under the then-powerful influence of Mithraistic beliefs] to the effect that he had died on the cross in order to atone for the "original sin" with which mankind is allegedly burdened; and this legend became so firmly established among the latter-day followers of Jesus that even his enemies, the Jews, began to believe it - albeit in a derogatory sense [for crucifixion was, in those times, a heinous form of death penalty reserved for the lowest criminals]. This to my mind, is the only satisfactory explanation of the phrase wa-lakin shubbiha lahum, the more so as the expression shubbiha li, "[a thing] became a fancied image to me", i.e., "in my mind" - in other words, "[it] seemed to me" [see Qamus, art. khayala, as well as Lane II, 833, and IV, 1500]. If one was to open an English Dictionary one would find that the verb "crucify" means; "Put to death by fastening (or nailing) to a cross." According to the "Swoon Theory" advocated by Sheikh Ahmed Deedat and discussed at length under the article The Qur'an does not say; *JESUS WAS SUBSTITUTED* on the CROSS on this web site, Jesus was nailed on the Cross but due to the short period of him being on the Cross for the reasons explained below, he simply fainted, went into a comma and did not die on the Cross . Jesus was tried by the Roman Governor Pilate on the day of Preparation for the Passover at about noon (see John 19: 14). Thereafter Jesus was taken to the Place of the Skull (Golgotha), carrying his own Cross. Here he was nailed in the late afternoon. The Jews did not want the body of Jesus to be left on the Cross after the Sunset because of the Jewish Sabbath -- a day of great solemnity (see John 19: 31). The fainted Jesus was thus lowered only after a few hours of his nailing. Furthermore the Roman soldiers did not break the legs of Jesus (John 19: 32). Jesus was laid down on a big stone in a new rock tomb which was in the nearby garden. A large stone was placed to cover the big entrance of that rock tomb. A disciple of Jesus named Nicodemus wrapped the nailed and fainted body of Jesus, according to the burial customs of the Jews with linen cloths containing a mixture of myrrh, aloes and spices, weighing nearly hundred pounds (see John 19: 39). Jesus awoke and walked his way out of the tomb and sat in the garden expecting his disciples to show. When Mary Magdalene came to the garden in the early morning she saw the stone had been removed from the tomb (see John 20:1). Awakened Jesus spoke to Mary. Jesus had fainted on the Cross but did not die. Hence, it is incorrect to say that Jesus was Crucified. Jesus was not "CRUCIFIED" but it only appeared to the people watching the Ceremony of the Crucifixion that he had been. The last line of the above verse, "For of a certainty, they did not slay him." supports this theory. When Jesus met his disciples in private, he showed them is nail marks to prove that he was yet in his original physical body in which he was nailed to the Cross. He was the same person with the same body. Since his enemies - the Jews, were not convinced that Jesus could have died on the Cross within such a short time, he withdrew from his disciples and lived the rest of his life in secret and died the natural death. The disciples, spread the word that they saw Jesus being "carried up into heaven" (Luke 24: 51) by angles.